On August 29th, 2005, Hurricane Katrina battered the Gulf Coast with powerful winds and massive amounts of rains. The resulting floods left a trail of widespread destruction across the region. In this Planet Diary activity, you'll take a closer look at the fury unleashed by this violent storm. First, take a look at this animated radar view of Hurricane Katrina as it made landfall along the Gulf Coast. Where did the hurricane's heaviest rain bands (red and yellow) strike? Check out this false-color NOAA flood map of New Orleans. Which colors show the worst flooding in the city? Look at this false-color map of Hurricane Katrina's rain rate. Which color shows the highest rain rate? Where and when were Katrina's rains most intense? Read the caption below the map. What was Katrina's hurricane category and rain rate when it made landfall near New Orleans? What helped keep rainfall totals low as Katrina moved across the central United States? Watch this animation of Katrina's path. Describe the path Katrina took from August 23–31. Take a look at this surface water map following Katrina's landfall (on the left). Red and yellow show the largest increase in surface water. 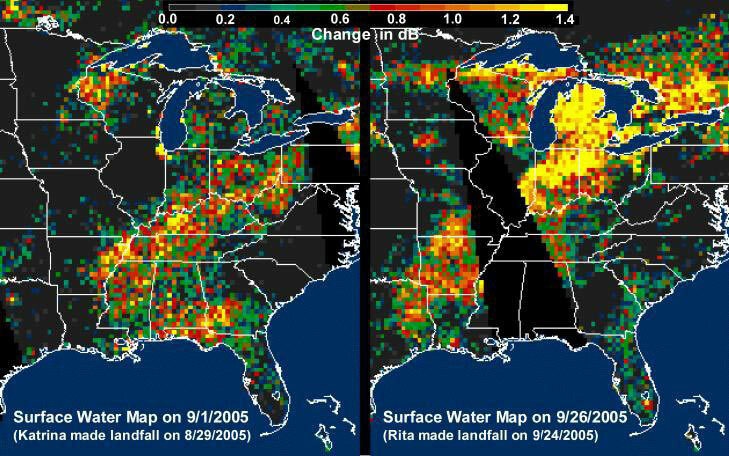 Which parts of the country had the biggest increase in surface water from Katrina?